Are you embarking on the writing of your first science fiction book? If so, our beginner’s guide to this particular genre will help you. 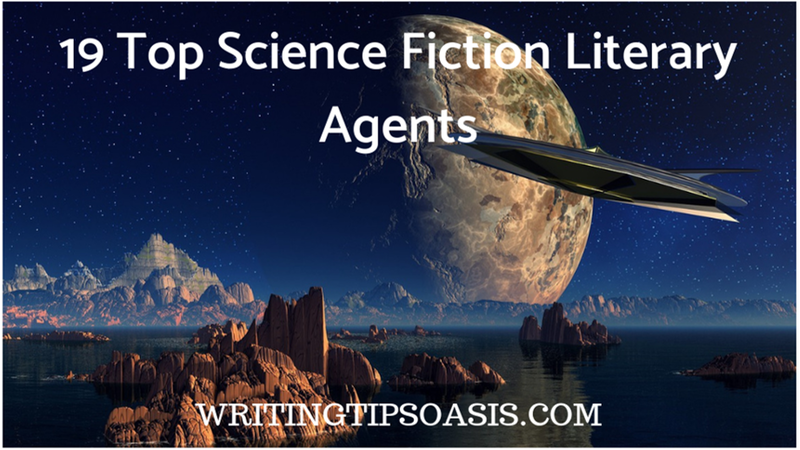 On the other hand, if your manuscript is ready and you believe you’ve written a bestseller, one of the following 19 top science fiction literary agents might be able to help you find a top book publisher. With 15 years’ experience as an agent, Michael has had the fortune to work with entrepreneurs, celebrities, athletes, musicians and actors. Today at Folio Literary Management, he is building a strong list of clients and writers that connect with the audience. Fiction or non-fiction, the writing needs to be real, clear and crisp for him to like the material. Does your book have a message or something new to say? It’s one of the main questions he needs answered when looking at manuscripts or proposal. His list of bestselling authors will provide testimony to his skills and excellence. Michael is mainly seeking fiction, science fiction, fantasy, non-fiction, popular culture, sports and music. Send your proposal via email or attach the first 3 chapters of your manuscript. Editor, publisher and now literary agent, John Silbersack has been in the publishing industry for 17 years. Also a founder of several imprints, John’s experience has enabled him to spot literary talent easily and nourish them. He enjoys working as an agent at The Bent Agency in tandem with new authors and writers to guide and encourage their skills. As a writer himself, he understands the support writers need from their agents. Having worked with several bestselling authors, he is looking for history, literary fiction, science fiction, young adult, middle grade, biography, fantasy and mystery. Read the submission guidelines carefully before sending a query to John via email. Starting as an assistant to another agent, Michael Curry now is one of the Donald Maass Literary Agency’s promising agents with an expanding client list. There is a growing need for authors from diverse backgrounds and underrepresented circles. Michael is eager to represent such authors and writers. His current client list includes award winners and prominent authors. He is interested in acquiring science fiction, fantasy and literary fiction. Include a synopsis of 1-2 pages and the first 5 pages of your book pasted into the body of an email. Please don’t send any attachments. Direct your queries to this address. Twenty years of experience in the publishing industry has led Laura to dominate her field. A literary agent at FinePrint Literary Management, she has worked with impressive publishers such as Columbia University Press. While she works prominently with academics, professors and researchers, she is keen on expanding her fiction list. Science Fiction, Mystery, Fantasy are the genres she is keen on acquiring. Send a query letter with synopsis, bio and the first 2 chapters (not exceeding 30 pages) pasted in the body of an email. You can write to Laura on this address. The Vice-President of JABberwocky Literary Agency, Eddie Schneider is relentless in finding and supporting new authors. A purveyor of great fiction and non-fiction, he has represented Hugo, Bram Stoker Award winners and New York Times bestselling authors. Marginalized voices, authors from different backgrounds and facing special challenges are also welcome by Eddie. For a new and amateur author, he would be a great agent to work with and one that allows you to flourish and develop. He is seeking literary fiction, fantasy, young adult, middle grade, science fiction, graphic novels, narrative non-fiction and history. Send the first 5 pages of your manuscript and paste them along with a query letter in the body of an email. Write to Eddie on this email address. A literary agent at Sandra Dijkstra Literary Agency since 2011, Thao has a passion for strongly woven plots and unique writing. She urges her clients to push the boundaries of any genre and disrupt traditions. Heartfelt, real stories with prominent characters are a major pull for her. The genres she represents include young adult fiction, middle grade, science fiction, fantasy and picture books. Recent clients include popular names such as Elle Katharine White, Sandhya Menon and Roshani Chokshi. Interested writers and authors can submit their manuscript using the agency’s online form. An agent since 2003, Ginger is working at Curtis Brown Ltd. Working with the New York based agency, she is at the centre of the literary world. Eager, excited authors become professional writers who know how to polish and refine their skills under her tutelage. Having previously worked as an assistant agent at Writer’s House, she understands the nitty gritty involved in supporting and aiding authors on their journey. She is acquiring science fiction, fantasy, middle grade fiction, young adult fiction and non-fiction. You can send a query letter via email. A lawyer and a literary agent at Writer’s House, Jodi Reamer is an agent beyond compare. Representing iconic authors such as Stephanie Meyers of the Twilight fame, John Green, Carla Neggers, Lisa Yee and Blake Nelson, she can help new authors and writers navigate the complicated world of publishing. Writing a bestseller is more than having a great story and Jodi can assist new, fresh authors in understanding that. 20 years of experience have pushed her to the top of her industry and given vast amounts of experience to draw from. She is interested in genres like children’s books, romance, mystery, lifestyle, biography, science fiction, fantasy fiction and general fiction. Send the first 10 pages or the first chapter of your manuscript via email. Working as an agent at Foundry Literary + Media, Jessica is getting her feet wet as a literary agent. What she lacks in experience, she makes up for in passion and hard work. Engaging storylines, tight plots, one-of-a-kind works are things that attract her. She is using her dedication to provide best contracts, marketing, promotional support and guidance to writers in need. Jessica is looking to represent clients in fiction, historical fiction, science fiction, fantasy and commercial fiction. Read the submission guidelines carefully before sending your proposal. You can send a query via email to Jessica. Writers can look at the world in a completely different manner than others and that is what intrigues Anne. Now at Janklow & Nesbit, she is looking forward to work with new, promising authors. Being their guide, friend, critic and mentor in a cut-throat publishing world is not an easy job. She makes sure their book and story gets the attention and audience it deserves without being overwhelming. Originally just a voracious reader, she decided to channel her hobbies into something constructive. The right literary agent can be the difference between a failure and a success and Anne is the right choice for several writers. Authors of fiction, science fiction, fantasy and commercial fiction can consider sending her a query. Find the submissions guidelines and email address mentioned on this page. With award winning clients under his roster, Adam Schear knows how to succeed as a literary agent. Presently at DeFiore & Company, he has been there since 2009. Previous clients have also been long-listed for many prestigious awards and nominations. Fiction should have the ability to transport you into a different world and Adam wants his authors to do the same. He is seeking unique voices and stories in fiction, science fiction, young adult, fantasy and literary memoirs. Send a query letter, bio and the first 5 pages in the body of an email to Adam. Working with a full service literary agency in Denver, Sara Megibow has 11 years of experience. Now at kt literary, Sara has been a staunch advocate of diverse, female, LGBTQ writers and always ready to give them a chance. Authors of middle grade, young adult, fantasy and science fiction can collaborate with her to achieve their dreams of becoming a published author. Using her knack of knowing what sells; she can make your story stand out among the sea of other books coming out every day. Read the submission guidelines mentioned on the website and then send an email to Sara outlining your proposal. Now at Fuse Literary, Emily has also worked with firms like Simon & Schuster and L. Perkins Agency. Writing good fiction means understanding the emotions of your audience and letting them react to your story instinctively. Her love for reading books has given the gift of recognizing a bestseller and award winning book. Fantasy, science fiction, fiction, middle grade, young adult, women’s fiction and historical fiction are her preferred genres. Paste a query letter and the first 10 pages of your manuscript in the body of an email. An associate agent at Margret McBride Literary Agency, Faye is just building her client list. Her varied tastes and fresh entry into the world of publishing has given her a new perspective on things. She is more receptive to challenging material, unheard stories and off beat ideas. Working in a boutique agency in San Diego has given her the tools to handle heavy workload on her own and recognizing talent by just perusing manuscripts. Commercial fiction, science fiction, fantasy, young adult, paranormal, women’s fiction, non-fiction, pop culture, health and history are the genres she is adding to her repertoire. Find the submission guidelines mentioned on this page and send your query via email. Having worked in books and publishing all her life, Rena is also a writer. As a writer she knows the resources required by an author when starting to write a book and she decided to offer those in the form of a literary agent. Now an agent at The Deborah Harris Agency, she is eager to groom fresh, new voices and let them take the leap in the publishing field. Looking for fiction, science fiction, fantasy, speculative fiction, women’s fiction, young adult and middle grade, check the submission guidelines here. After you read the guidelines, send your query via email to Rena. An associate agent at Red Sofa Literary, Erik Hane is also an editor. These two roles have enabled him to gauge literary talent among the pile of manuscripts on his desk. He can suggest how to compile your manuscript, how to market, where to target it and when to launch it. The essential part of being an agent is letting the author take the lead creatively while you handle the technical and business aspects. Erik wants stories with a strong focus on character development, plots and pace. Simple words will suffice to convey an interesting idea, according to him. He is acquiring fiction, science fiction, fantasy, realism, non-fiction, sports, history and current events. Find the submission guidelines and contact details mentioned on this page. A writer who is new to the publishing landscape will need hand-holding, creative support and just a shoulder to lean on. Kurestin will do all of those magnificently and also work on getting your story noticed by the right people and publishers. Getting lucrative deals and contracts for his authors is a skill of this agent at P.S. Literary. Currently she’s seeking LGBTQ, fantasy, science fiction, Young Adult, Middle Grade, non-fiction, culture, nature and design. The submission guidelines and contact details are listed on this page for writers and authors. A writer and editor for almost 30 years, Dave decided to pursue another profile in the publishing industry. His skills translated comfortably into being a literary agent and he has worked with several successful authors and writers since then. As an agent at Wordwise Media Services, he can point out the parts of your book, writing and story that need work or polishing and present it in the best light to potential publishers and buyers. He is interested in authors and writers of career, reference, fiction, science fiction, historical fiction and fantasy. Read their extensive submission guidelines carefully before sending a query letter to Dave. An agent at Dunham Literary Inc. since 2011, Bridget has had worked in multiple fields. From microgravity to Radio DJ-ing, she has donned several hats and finally settled on being a literary agent. Those career changes have allowed her a world view very different from hardened publishing professionals. Her innate curiosity, enthusiasm for understanding how the world works and supporting creative people makes her an ideal fit for this job. Character driven stories with intricate stories, impressionable people and new voices pull her to a book. At present she is looking to represent authors of fiction, young adult, middle grade, historical fiction, romance, contemporary fiction, science fiction and women’s fiction. Send a query letter via email after following the submission instructions mentioned here. You can expect up to 4 weeks for a reply if Bridget is interested in pursuing your proposal. Do you know any other science fiction literary agents? If so, please tell us about them in the comments box below!